The first quarter moon is riding high in the western sky in the early evening this week, a perfect time to explore its surface with binoculars or a small telescope. You might think the best time to look at the moon with binoculars or a small telescope is when the moon is full, because it looks so big and bright. Well, that's usually the worst time of the month for observing the moon. That's because at full moon, the sun is high overhead on the moon's surface, making it look like the desert at high noon. Far better times are at first and last quarters, when the sun is shining obliquely across the moon’s terrain, casting mountains and craters into high relief. Because the moon is a world in its own right, and almost as large as the planet Mercury, and because it is so close to us, its surface geography is known almost as well as that of the Earth. Its surface has been mapped for hundreds of years, and most of its features have been named. 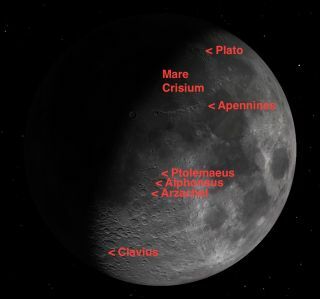 Everyone who studies the moon soon becomes familiar with its major features and their names. What catches everyone's attention first at this phase of the moon is the three gigantic craters almost exactly in the center of the moon. Like almost all the craters on the moon, these are named for famous astronomers of antiquity. The northernmost and largest of the three is Ptolemaeus, named for Claudius Ptolemy. His name was given pride of place on the moon because he was probably the greatest astronomer of antiquity. His book, the "Almagest," was written in the middle of the second century A.D., and summarized all of astronomical knowledge of his time. It was written in Greek, but is known by its Arabic title because it only survived into the modern day in an Arabic translation. The crater Ptolemaeus is 95 miles (153 km) in diameter, and is characterized by a wide flat floor pockmarked by many craterlets. The middle crater of these three is Alphonsus, named for Alphonso El Sabio, king of Castile (in what is now Spain) in the 13th century. Besides being a king, he was also an astronomer and a musician, and compiled the Alphonsine tables, which were used to calculate planetary positions until the time of Kepler. This crater is a bit smaller than Ptolemaeus, but is more of a typical lunar crater with a central peak and a complex system of rilles (grooves) on its floor. This crater became famous in the 1950s when a Russian astronomer claimed to have seen a volcanic emission in it. The third crater, Arzachel, is smaller still, 60 miles (97 km) in diameter, but with a larger central peak. To the west of the Apennines is the broad expanse of the Mare Imbrium, the so-called "Sea of Rains." Early astronomers had no idea how dry and airless the moon was, and its "seas" are dryer than the driest deserts on Earth. This is the second largest "mare" on the moon, exceeded only by the Oceanus Procellarum to its south. The Mare Imbrium is a huge flat plain 720 miles (1160 km) across, with an area of 320,000 square miles (830,000 sq. km). It contains many small mountain massifs and individual peaks. The lunar Alps are to its north, enclosing the beautiful crater Plato, 63 miles (101 km) in diameter. Plato's almost flat floor contains a number of craterlets, which are used by lunar astronomers to test the resolution of their telescopes. How many can you see? Near the moon's south pole, look for the gigantic crater Clavius, 140 miles (225 km) in diameter, and containing a whole series of craters in its interior graded in size. The largest of these is large enough to warrant a name of its own, Rutherford, 32 miles (51 km) in diameter. With these landmarks learned, you can begin your exploration of the moon's finer details. What I like to do myself is to start at the moon's north pole and work my way down toward the southern highlands along the terminator, using a good lunar map to identify the topography. Most of the features I've described can be seen with ordinary binoculars. Even the smallest telescope will reveal hundreds of smaller features. The moon is generally a good target for photography, because it is so bright that long exposures are not needed. You can even put your smartphone up to the eyepiece of your telescope and get remarkably good photos that way. Editor's note: If you capture an amazing view of the moon that you'd like to share with Space.com and our news partners for a story or photo gallery, send images and comments in to managing editor Tariq Malik at: spacephotos@space.com.